The SAS survival trainer and all round legend Lofty Wiseman said 'where there's a snake there's a steak'. 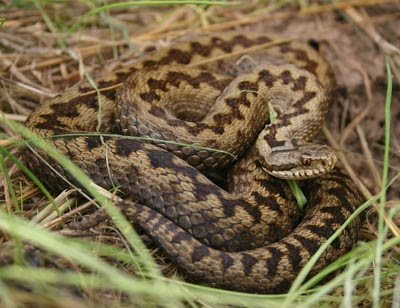 Here in Blighty our best known native snake is an virtually an endangered species so I'm waiting until I'm stateside before i find out if the herpetofauna is succulent or chewy. I'm hoping my wild food hero will post a comment and let us know. "Torremolinos, Spain, 1975. I met a great white hunter at a party. He complained that by the mid-70s the great white hunting business wasn’t what it used to be. Thanks to unfriendly poachers, vigilant rangers and inflation, there just weren’t that many safaris any more. Things had come to such an ugly pass, he continued, that he was available for almost any reasonably legal employment. Consequently, when a British movie company came to his part of Africa on location, he signed on with them as an assistant animal handler." I've read posts by Johan of Nordic Bushcraft on one of the bushcraft sites, he knows his stuff so I've added him to my blog roll. For those of you you who always feel a the need for more cutlery (you know who you are) he has some really nice traditional knives for sale amongst other cool bushcrafty stuff. Well worth a look.